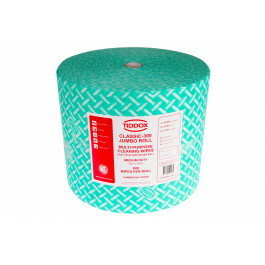 Replace your painters’ bag of rags with TIDDOX’s CLASSIC JUMBO ROLL of painters’ cloths! These sturdy, disposable cloths will become your go-to painter’s rag regardless of the job. The green towels come on a whopping 300 meter-long roll with 600 perforated towels per roll. The JUMBO ROLL FLOOR DISPENSER is foldable and portable, so you can take it to various job sites. This will keep your roll of painter’s wipes handy and accessible. These cloths have a high enough viscose content rating that they can easily absorb a variety of liquids and semi-liquids. Use them to soak up the coffee spill or to apply gel stain to the new paneling or wiping up paint spills. They are tough enough to hold their structure when soaked with solvents, so you can scrub an area without worrying about the cloth coming apart and making an even bigger mess. Limit the spread of spilled paint by dropping a couple of these rags on the spill. It will pull even thicker paint into the fibers of the towel until it can be thrown away. Then, use another rag with solvent to clean up the remainder. Don’t worry, the rag won’t come apart. The CLASSIC JUMBO ROLL of painters wipers is designed in a bulk format of 600 wipes packaged on a roll to save you money on shipping and storage. Once you try these green towels, you won’t want any other rag for painters. This will be your choice every time! Other related products from TIDDOX's range of painting rags and cloths are the JUMBO RHINO ROLL and the WHITE T-SHIRT RAGS.